Tashmadada encourages collaboration between artists from different art forms (theatre practitioners, visual artists, writers,composers etc) and cultures; connects with new artists; and engages with the arts ecology. By creating new works as well as working with existing texts in an original and innovative manner, Tashmadada encourages discussion and engagement in arts practice - using theatre and the arts to articulate the multiplicity of voices and cultural traditions. Tashmadada nurtures and develops collaborations - both on a national and international level. Tashmadada is a not for profit incorporated association with DGR and TCC status. ​Tashmadada acts as an auspicing body for creative projects - providing logistical, creative, curatorial and financial services. A multi-disciplinary performance work about older women’s homelessness, one of the fastest growing types of homelessness. Spanish performance maker, Younes Bachir presents Andante, together with our own The Present Performer, in Brisbane in October as part of Backbone's 'How Soon is Now' 2018 festival. 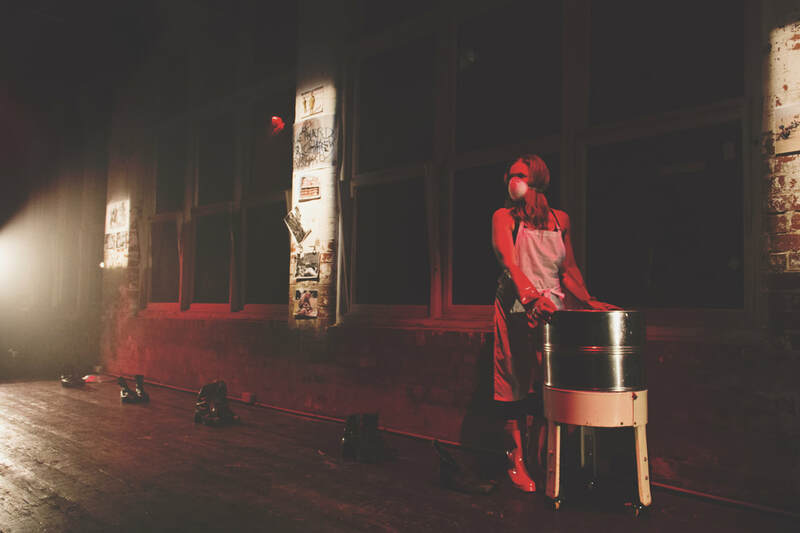 KaBooM uses a combination of visceral imagery, thorough research and the sheer discomfort and atmosphere of the site-specific location to bring audiences on a haunting journey through the darkest, most mind-numbingly horrific aspects of war, with plenty to reflect on on the way home. First seen at fortyfivedownstairs in Melbourne, then Alice Desert Festival, Alice Springs, and in August 2018 as part of the George Town Festival, Penang, Malaysia. This performance piece was made into short film. We received seed funding thanks to being a recipient of JIFF's Short Film Fund. Screenings were at JIFF Sydney, Melbourne, Brisbane, Canberra and Perth in November. ​Thanks also to all the generous donations that made this film possible. ​This play by Peta Tait was first presented at Heide Museum, Melbourne before touring to the Centre for Photography in Perth. In December 2018 it was presented at the Seymour Centre part of a program celebrating the 70th year since the Human Rights Declaration.